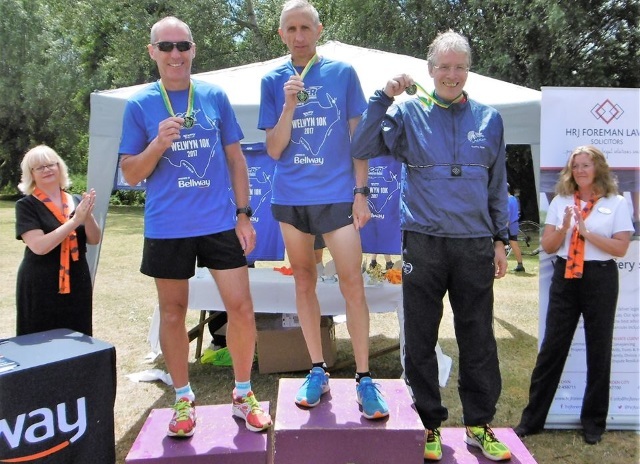 BRIAN WHITE and JIM BROWN were on the podium together after Sunday’s Welwyn 10K which included the county championships for veteran runners. They won the SILVER and BRONZE medals in the male 60 plus category and won the second and third place trophies for the same category in the open race. CLAIRE PULLEN took SILVER in the women’s 45 plus county championship. In addition Brian White, STEVE GREEN, TIM SABAN and MARK GOODWIN won silver in the county men’s team competition. This was a morning for negative splits – running the second half faster than the first. A tough kilometre around the four kilometre mark added to the net climb from the start meant many runners were about two minutes quicker in the second 5K. MIKE GREEN was the quickest Spartan finishing 18th out of about 600 runners in a great time for such an undulating course, a sub forty 39 minutes 10 seconds. Next came BRIAN WHITE’s medal winning performance 40:30, 24th overall and a good for age score over 80%. STEVE GREEN came in with 41:09 at 28th and TIM SABAN with 43:53 at 48th. CLAIRE PULLEN was the club’s fastest woman with 45 minutes 58 seconds to score over 75%. She was 72nd with JOHN NELMS just ahead with the same time and MARK GOODWIN three seconds behind at 73rd with 46:01. HANNAH NEALE made into the top hundred with a very useful 46:47 at 85th. She was the fifth senior woman (18-34). JIM BROWN beat the fifty with 49:01. Next came CHRIS HOLLAND in 51:30; KEN JUDE in 52:43; HAYLEY BIRONNEAU in 53:17; LISA GRAY in 53:37; ALICE BURLEIGH in 55:54; and ALEXANDRA WHITEHOUSE in 1:01:38. CAREN THAIN and KELLY CHAPMAN looked like they were thoroughly enjoying themselves as they finished their 10K in 1:22:35. Now scores of Spartans are looking forward to running 10K in the Mid Week League race around Stevenage this Wednesday evening. GRANT RAMSAY was in Birmingham for the British Masters Track and Field Championships . In the 3000 metres steeplechase he won BRONZE in the 45 plus category with 11 minutes 40 seconds. The Trent Triffic Trail is a tough trail run with steep long uphill grinds through the woods and parkland of Trent Park. Spartan TIM ROBINSON was 148th in 50 minutes 49 seconds. On a lovely Friday evening in the small Essex village of Pleshey, ROGER BIGGS completed the Springfield Friday 5 miles in a time of 49:14. A cool breeze made for good running conditions at Sunday’s Herts Hobble off-road marathon which this year took in the villages of Bramfield, Chapmore End, Westmill, Thundridge, Sacombe, Dane End, Little Munden, Ardeley, Benington, Watton-at-Stone and Tewin, along with large sections of the Woodhall Estate and Hanbury Manor. Trudy Molloy (in her first off road marathon), Tricia Hopper, Karen Liddle and Barry King all finished together in 6:41:42; Mike Newbitt and Paul Holgate were not far behind in 6:42:55 while Sharon and Mike Crowley both walked the event in 7:10:55. It was a humid Saturday morning with not many Spartans taking the parkrun option this week. At Stevenage, KEITH COUGHLIN was first across the line in 18:37. NICK GILL was next Spartan, finishing 19th in 22:05 and STEVE SMITHSON was 39th in 23:40. The other men running were JOHN MCCALL (27:45), ROGER BIGGS (28:33), TREVOR BROOM (a new course PB of 37:05) and SELVAN NAICKER (43:39). For the women VERITY FISHER was sixth in 24:38 and TRACY PEZ continues to progress after injury, finishing seventh in 24:44. SARAH RUSHWORTH ran her first ever parkrun and squeezed just inside the 30 minutes mark in 29:59 to finish 36th, while Sally Phillips finished 50th in 31:04. Elsewhere BARRY OSBORNE was 13th at Ellenbrook Fields in a time of 21:02, while DARYL STEVENS was 81st at Upton House near Poole in 43:20. Bassingbourn Mixed Terrain Half Marathon on Sunday 2nd July.